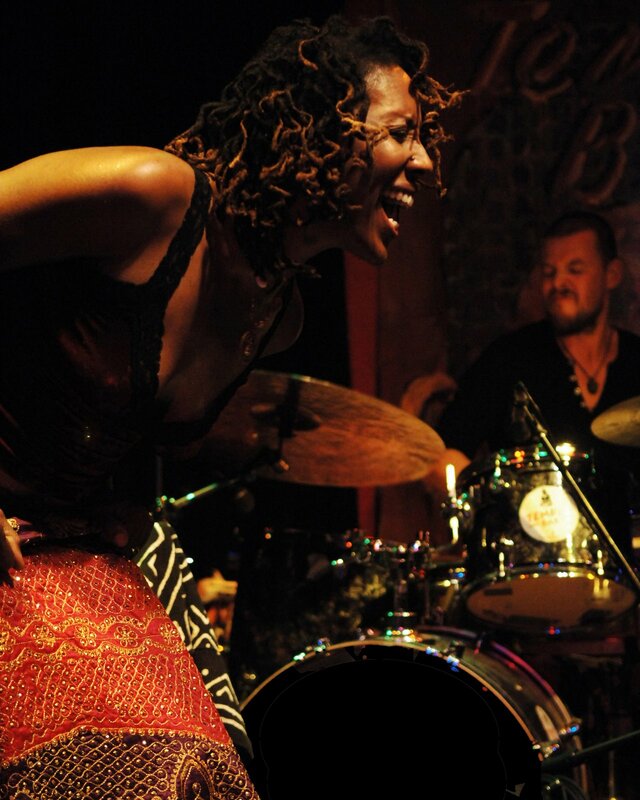 Thank you Nailah, for your voice, your lyrical vision, your choice of such a powerful band, featuring Deron Johnson on piano, Justin DiCenzo on bass, Paul Legapsi on drums, and Matt DeMerrit and Tracy Wannomae as a two man horn orchestra. These are the program notes from that magical afternoon…. You hear that stomp, that rootedness to the south, the need to compassionately explore all the suffering and sweetness of her Carolina soil in Nailah’s lyrics. You will hear about her blood relations. Please listen for Uncle Cool Jack. When Nailah first moved to Los Angeles from D.C, to pursue her music full time, leaving behind a meaningful and lucrative career as a Capitol Hill lawyer, she had a moment of doubt so great she went back to the safety of her Uncle Cool Jack and Aunt Katie’s Winston Salem home. After telling them how hard it was out west in the industry, Uncle Cool Jack got quiet. And serious. Then says to his niece: “You know I was 45 before I could look a white man in the eye? You don’t know nothin’ about no pain. You better get back out there and finish what you started. Stand up and finish.” Have mercy. And thank god she listened. Nailah came back to Los Angeles, was emboldened by the proud and profound energy of Leimert Park’s Jazz community, fortified by the spiritual wisdom of her Agape community led by Reverend Michael Beckwith, and is here today with us transmitting the energy of all she’s experienced from North Carolina to Capitol Hill, to Culver City with love, with compassion, with gratitude. This line from the poem “Papa, The Lean Griot” written by our Leimert park genius elder poet, Kamau Daaood, written in dedication to his Leimert Park genius elder jazz master, Horace Tapscott, resonates so sweet for me this week as I consider Nailah in the legacy of her genius elder vocalists who recently became spiritual ancestors, Odetta and Miriam Makeba. Nailah’s musical influences have given her permission to create her form rather than fitting into any one form. She gives praise to Sarah Vaughn for the fierceness as well as elegance of her instrument. She then swings from Sarah to Nona Hendryx, sharing how much she loved Labelle, but in that group she was always listening for the bottom, listening for Nona’s harmonies. And again the “fierceness of them stepping out in space suits!” I do not fit into form, I create form. Curtis Mayfield and Gil Scott Heron are teachers for their songwriting, their political insight and courage as well. Regarding Cassandra Wilson (who, I swear if my father were alive and heard Nailah sing…he’d say “Cassandra needs to step aside”…he’d say it with the greatest love for his Mississippi homegirl Cassandra and as the finest compliment to Nailah) Nailah gives thanks to Cassandra for making her “feel like it was okay to bring my southern roots into it….the space, the openness and richness of her voice…and somebody who says, you know, I don’t have to holler to be heard.” And, look, if there’s ever a drought, just play James Taylor singing “Carolina” for Nailah, and she will weep monsoon like tears for his soulful crooning about the home state they share and celebrate. Finally, Nailah lifts up Bill Withers, “He’s a black man with a guitar, singing simple songs about Grandma’s hands when everybody was doing funk? !” I do not fit into form, I create form. Nailah eases into the stomp and moan that begin Bill Wither’s “Grandma’s Hands” and the circle is complete. Touching the earth to remember and give thanks and transmit love and healing through song, that’s Nailah. Now, listen close…. 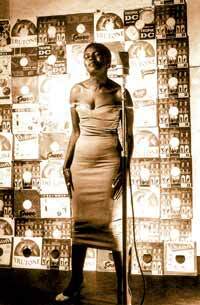 I feel more gratitude than grief right now as I consider that both Odetta and Miriam Makeba have joined the ancestors since Dia de Los Muertos, since the first Jazz on the Sacred Side. 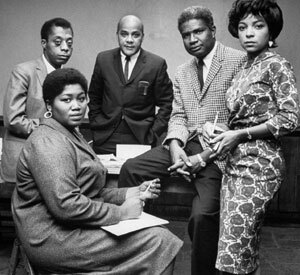 Searching for images of Odetta just now this one of her suited, seated, surrounded by heavyweights jumped out at me…because it makes me pause and remember that when these great figures die, it feels so critical to celebrate them in the context of community…as beloved community builders who would not rest until real love and real community were truly free for EVERYONE to experience. I feel so grateful to be part of the beloved community we are building with this series, in this city, in these trouble/hallelujah times.